Aristotle describes the different substance categories in Metaphysics Book XII. It is not for the faint of heart. Most of Aristotle’s work is reasonably accessible but this is a particularly difficult passage. In order for Aristotle’s ideas of the four causes to work everything in the universe must be explicable by it. He sets out various substance categories to help him do this. Substance category one is evident or sensible, subject to decay and affected by the four causes. This is by far the most common category and the vast majority of things exist in it: trees, aardvarks, jam, people, marmalade, etc. Note, this is not an exhaustive list! Substance category two is evident or sensible but not subject to decay. This category is also affected by the four causes. Aristotle places the universe and time in this category. This is based on his belief in pre-existing matter. The universe and time are in a constant state of change but will never perish. They are seen as eternal. Substance category three is not subject to the four causes and exists eternally. In this category Aristotle places the prime mover and mathematics (owing to the Ancient Greek’s belief that mathematics was eternal, awaiting discovery). Good students would be expected to be able to make the link between the four causes, potentiality and actuality, the substance categories and the role of the prime mover in holding all of the other concepts together logically. This essay was submitted by a student who scored an A grade (30/35) overall. 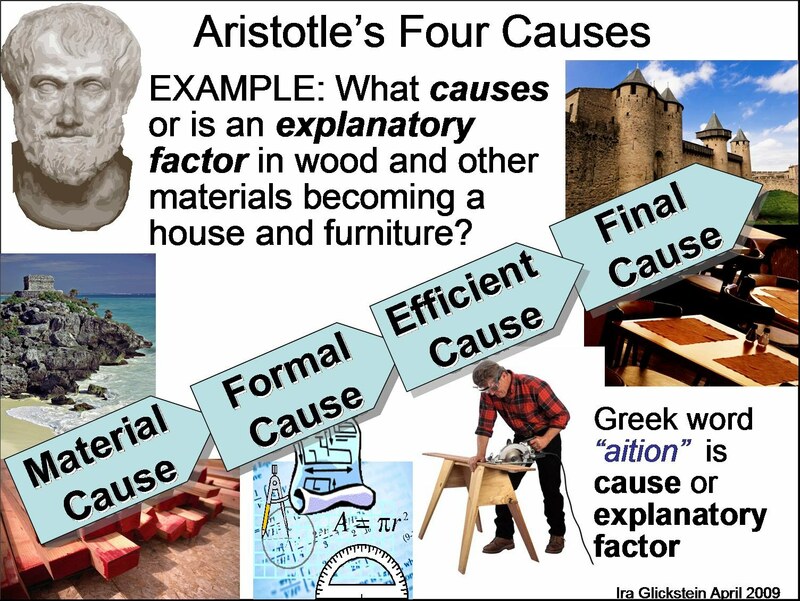 Aristotle’s Theory of the Four Causes is a theory that explains how everything that is observed in the world appears to have existed through cause and effect. The point is that these four causes can encompass an objects complete description, such as what it’s made of, what it looks like, what made it and its purpose. The Causation theory is the basis for much of Aristotle’s work, including Physics, Metaphysics, and The Politics. They clearly define Aristotle’s way of studying the world around him, which is empirical and observant of what we can see and know; a trait completely different to what Plato taught. The Final Cause differs greatly from the others because it describes something’s ultimate purpose, not just a material viewpoint, and God (or the Prime Mover) has to be our Final Cause as he alone is perfection, and everything good that we do is to seek perfection. The first three causes are the Material Cause, the Formal Cause and the Efficient Cause. The Material Cause is what something is made of, and without the material to make the object, the object could not exist. This essay is made up of words, but without words the essay would cease to exist. The Formal Cause is what the shape of an object is, or perhaps the structure of the object that makes it what it is. Without its shape it is just the material that has potential to be an object. This essay is in the shape of an essay; it has a title, is structured in paragraphs, and the sentences make sense and are relevant to the question being asked. If this essay was just a completely random combination of letters or words it would not be an essay, it would be gibberish. The Efficient Cause is what brought about the existence of an object, by shaping the materials into what it is. An essay is created by the person who writes it, and therefore this person is the Efficient Cause. Alone, these three Causes explain what the object is and how it came into being, but that is that. They do not explain what the object does, or what reason it was made. Without the Final Cause, this theory does not explain why, but only how.The Final Cause therefore explains the purpose of a thing’s existence, and what it is for. An essay could have many purposes. Its purpose may be to earn the student a high grade, show the teacher how much the student has advanced, educate others, and so on. According to Aristotle, everything has a purpose, including nature. Whether the purpose of a creature or plant is useful to man is irrelevant. For example, bees are useful to us because they make honey, but that does not mean that it is their purpose. Their purpose perhaps could be to pollinate flowers, or perhaps to make their hive grow as large as possible. The Final Cause is therefore perhaps the most important cause because it describes the object in a non-materialistic way and gives us an idea on why it is there. We do nothing without a reason for doing it, so every single action also has a Final Cause. What separates the Final Cause further than the three other causes is the fact that Aristotle’s idea of God is the Final Cause of change and movement, and therefore God is the Final Cause of us. Aristotle’s description of God arises from the idea of movement having a mover. Any kind of change has to have been made to happen by something or someone. A football flies through the air because it has been kicked by a footballer. Aristotle says that this eternal movement and change had to have started off with an unmoved mover, or Prime Mover. This is something that is a mover but does not move itself. According to the laws of physics, one cannot simply move something without moving itself, meaning that this Prime Mover is not the Efficient Cause of eternal movement. This is where Aristotle reasons that the Prime Mover must be a sort of perfect God, that caused movement through it wanting to be like him. Movement occurs as its purpose is to be like God, therefore the Final Cause of all movement and change is the Prime Mover. This is perhaps the most important reason why the Final Cause is so different from the other causes because it is actually the reason why we are all here in the first place, because humanity and the rest of nature wants to be as perfect as God, who doesn’t even know we exist. The other causes have only come as products of the Final Cause, showing how important this cause is in Aristotle’s theory. Aristotle’s causation theory is fundamental to most of the works that Aristotle has written. Not only to explain how one should observe the world around us but also to understand why objects and living things exist, whilst defining our own purpose in relation to an oblivious higher power. The way he describes to observe something is a strength because it means that virtually every physical object can be identified and described in the simplest format. And if everything has a purpose, it gives purpose to living anyway. Surely this is a positive outlook on life that one should adopt if a purpose to life is desired? But this raises the question: does everything have a purpose? Suppose you have a book that you are reading. The purpose of that book is to entertain you or inform you. But when you turn a page you accidentally rip off a piece of the corner, and you end up with a torn piece of paper between your fingertips. What is the function or purpose of that small bit of torn paper? Through your mistake, you have created something pointless, and although we can see how it was made and why it came to be made in that way, it does not have a purpose to do something and it never will. The same can go for litter. It once had a purpose, but once that purpose is exhausted, what is it supposed to do then? And what of creatures or diseases that endanger other life? What is the point of a cancer cell’s existence but to cause misery? Aristotle would argue that a cancer cell’s purpose would be to be a successful cancer cell, and to grow and multiply as big as possible, as that is how it survives. This may sound terrible but in relation to other living things it raises the important fact that all of nature has its own purpose, whether it is useful to us or not. A sheep is useful to us because it gives us wool and we can ultimately eat its babies, but that is not its purpose. The sheep’s purpose is to grow to be the ideal sheep, through eating grass and reproducing to help the race of sheep. This is a strength because it shows to us that nature itself has a purpose and we should not assume that its purpose should be to be useful to us. And one cannot argue that we, being divine beings have nature as our servant, because otherwise everything would have a function for us. But many would argue that nothing has a purpose and things exist because they just do. Only man can have a purpose because it is intelligent enough to give itself a purpose; a person is not born with one, however they choose it for themselves. This is an existentialist theory and greatly conflicts with the Causation theory. And to many it seems like a lot more realistic, as if something was to have a purpose it must have been assigned that purpose by a greater power. To Aristotle, the greater power is the Prime Mover, but he doesn’t even know of our existence, so he certainly didn’t give us a purpose. If he didn’t, what did? Aristotle combats this by saying it is how the Prime Mover is so perfect we are drawn to wanting to be like him as everything wants to be perfect, therefore the Prime Mover is everything’s final cause. This too seems like a valid explanation against Existentialists, showing a strength in his teachings. But he never describes the link between us and the Prime Mover. How do we know of his existence in the first place, and do we really feel drawn to be like him? It also implies that all inanimate objects somehow have a desire to be perfect, which can seem absurd. Aristotle’s causation theory provides an accurate account of observation but the Final Cause appears unreliable in describing how absolutely everything has a purpose. Candidates may be aware that Aristotle developed his notions of the concept of cause and effect in the Metaphysics. They may also be aware that the idea became central to all of his work. Some may outline, with some explanation, the four types of cause he describes in his work; material, formal, efficient and final. This may lead to an exploration of how one leads on from the other. Without a material cause nothing would exist and hence it is the first cause; however “wood” without a formal cause could never be a desk. Candidates may note that the form of a desk is, in this case, immanent and not related to Plato’s Forms. Some may then argue that it becomes clear that for a piece of wood to take the form of something like a desk there has to be a desk maker, and hence an efficient cause. This may lead some onto a discussion of the importance of the way Aristotle understands “final cause” or for him the purpose of any thing. His belief that all nature has a purpose is going to become very important for much of the rest of his metaphysics. Some candidates may begin by exploring what might be meant by the real world in this or any other context. They may compare Aristotle’s attempts to understand the nature of the world with that of his teacher Plato, assessing whether or not his description was any more successful. Others may assess the extent to which Aristotle’s views are an accurate description as they stand of the world; might it not be said, for example, that the extinction of many species would argue that not everything has a purpose?